Although the calendar says "Spring," the thermometer still feels like Winter. Meanwhile, the Friends of Ned Wolf Park are excitedly planning our annual Plant Sale for Saturday, May 19th, 2018 from 10 am to 1 pm. 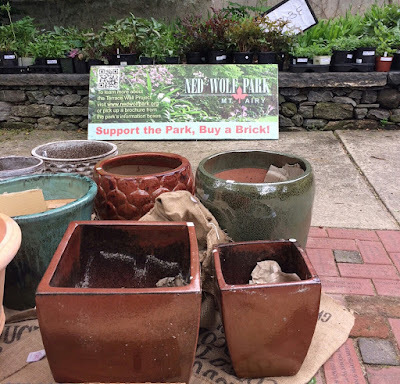 We are looking to sell more plants, a wider selection, at prices well below retail to fund our ongoing efforts to maintain and enhance the park. In addition to donated and locally raised perennial plants for sun and shade, we're hunting to source some herbs and annuals to sell as well. And we are thrilled to again be able to offer a small quantity of glazed pots donated by Campania, International. Look forward to our raffle planters that will feature artfully composed containers that will thrill you all season if you are the lucky winner. If you visit, you can count on enthusiastic, knowledgeable neighbors to offer gardening advice and to share design tips for those who need it. It is sure to be a fun day!